Known as the East St. Paul School District when it was established in June 1888, in 1927 it was renamed the Birds Hill School District. In 1914, a two-storey brick schoolhouse was constructed on Lot 95 on the Birds Hill Road in the Rural Municipality of East St. Paul. 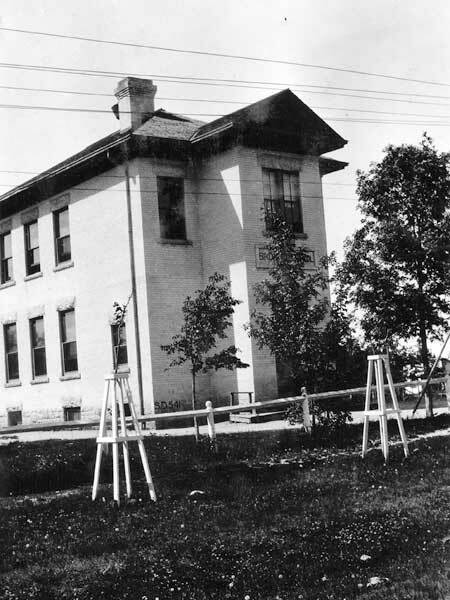 The foundation stone was laid on 22 May 1914 by Deputy Minister of Education Robert Fletcher before a large crowd of local citizens and school board officials. The two-room facility hosted 100 students and two teachers. Constructed with expansion in mind, with an option to add two classrooms, within two months of opening a $3,000 expansion was approved by local voters. As of 1984, the school had three classrooms with four portable classrooms on site, two of which were used as a gymasium and library, respectively. The building was put up for sale and demolished in March 1987. The site is now a shopping hall parking lot. The school’s name stone and cornerstone are displayed on the present school at Birds Hill. Among the teachers who worked at Birds Hill School through the years were Belle C. McGregor (1897), Dorothy Elizabeth Balderstone Langton (1931-1936), and John E. Dack (1933-1937). GR8461, A0233, C131-1, page 87. “The Indian famine fund,” Winnipeg Tribune, 4 March 1897, page 4. Winnipeg East topographic map, 62H/14 East, Edition 1, 1952, Series A743 [UFS Reference Collection]. Obituary [Dorothy Elizabeth Balderstone Langton (1907-2006)], Winnipeg Free Press, 9 February 2006, page 32.